Army's Smart Earplug Damps Explosive Noise, But Can Enhance Whispers : Shots - Health News Many combatants return from the battlefield with hearing loss. The U.S. Army has begun deploying a "smart earplug" system that can protect hearing without blocking crucial sounds. Sgt. 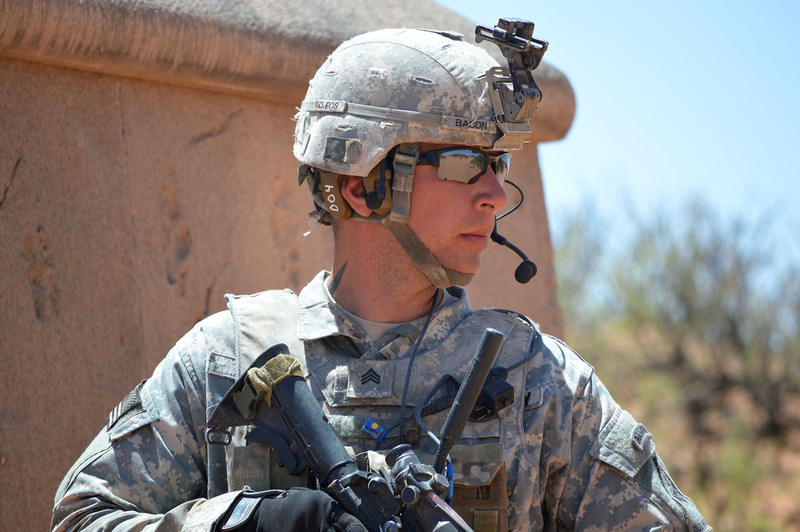 Jessie Bacon uses the Tactical Communications and Protective System to relay information to his squad in Fort Bliss, Texas. About 20,000 of the devices have been deployed so far. Since 2014, the U.S. Army has gradually been deploying the latest version of a hearing protection system that protects users from loud noises while still letting them hear the world around them. The system is called TCAPS, or Tactical Communication and Protective System, and about 20,000 of the new TCAPS devices have been deployed in the field so far. Hearing loss is a big problem in the military. A spokeswoman for the Defense Department Hearing Center of Excellence wrote in an email that 1 in 5 soldiers suffers hearing loss, based on data from 2013. "Your ears can't handle loud sounds without suffering mechanical damage to the inner ear that results in permanent hearing loss," says Lt. Col. Kristen Casto, audiology consultant to the Army's surgeon general. She says there are many ways to protect your ears when you're exposed to loud sounds. Sticking a piece of expandable foam in your ears does a pretty good job, "but when you need to maintain auditory awareness, that's not the proper hearing protector," she says. Maintaining auditory awareness means being able to hear quiet sounds that are potentially important — like a door opening, or a twig breaking — even when there are guns or explosions going off nearby. Casto says what fighters needed was a kind of smart earplug — one that could boost those soft sounds, "but then reduce the intensity of high-level impulse noises, so you're protected from that noise." The Army says TCAPS is designed to protect the hearing of soldiers on the battlefield, while allowing them also to maintain "situational awareness." "The technology's not really that complicated," says Doug Brungart, chief scientist at the Walter Reed National Military Medical Center's audiology and speech pathology center. 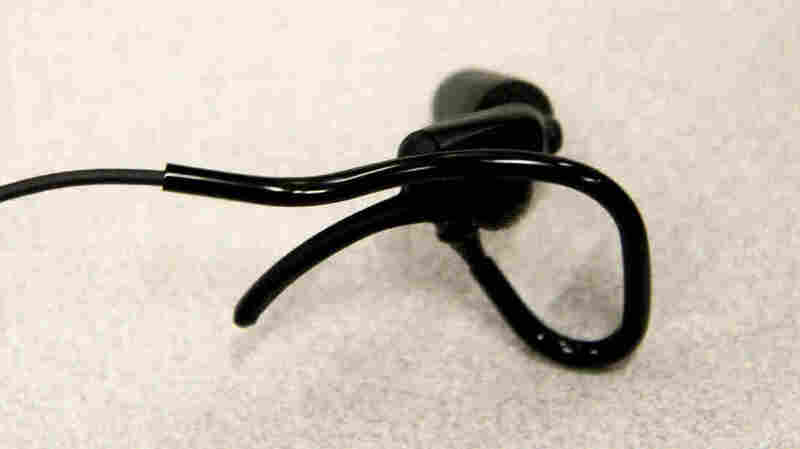 The TCAPS hearing protectors resemble a pair of earbuds with some built-in electronics. Some models can connect to a soldier's communication gear. Brungart says you can think of the system as having an adjustable volume knob. "The louder the sound outside gets," he says, "the more it turns down the volume. The person wearing the device can still hear the sound, but it's never going to get so loud that it's going to be damaging." Similarly, the device can increase the volume of soft sounds. The Army has produced a video describing TCAPS. The system is manufactured by Invisio, which also sells similar devices to law enforcement agencies. Any device that changes your perception of the world takes some getting used to, Casto says — even a new pair of glasses. "That's why we are very careful when we issue the devices that we train the users on how to use them," she says. "And we allow them time to adapt to them." Although the Pentagon knows how many TCAPS devices have been deployed, it's trickier to know whether troops always use them in the field. Brungart says troops are always wary of anything that could limit their hearing on the battlefield. "We really need them to feel like they're still able to maintain their awareness," he says. "The more advanced this technology is, that's really what we're focused on — this idea of transparency. That somebody wearing the protector will hear everything they need to hear." Brungart is confident that's the case with TCAPS, and says he's certain using the device will mean fewer veterans with permanent hearing problems. In the audio of this story, as in a previous Web version, we say that "more than half of all troops returning from Iraq or Afghanistan suffer from some sort of damage to their hearing." The U.S. Army says that is incorrect. Although it doesn't have precise figures for troops returning from Iraq or Afghanistan, a spokeswoman for the Defense Department Hearing Center of Excellence wrote in an email that 1 in 5 soldiers suffers hearing loss, based on data from 2013.